If you are interested in including resveratrol in your diet, you might usually think of the skins of grapes, and red wine. It’s just not practical to eat uncomfortably huge quantities of grapes or deal with the effects of alcohol in an attempt to get enough of the antioxidant protection you seek. 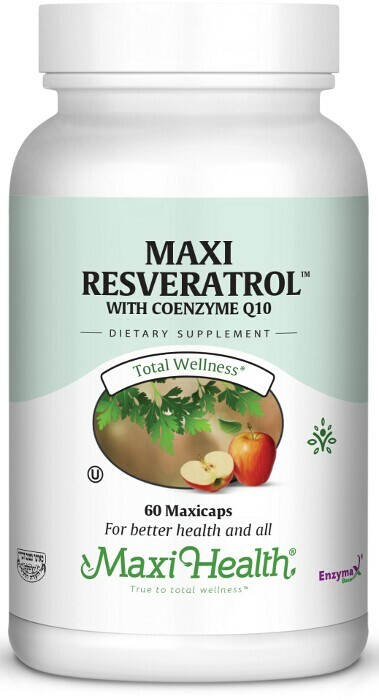 Maxi resveratol is the easy, economical, and predictable way to get the resveratrol that you desire on a daily basis. We have added Coenzyme Q10 to work with resveratol. Get this unique antioxidant formulation with our Maxi Resveratrol™! Take one (1) or two (2) Maxi-caps™ daily, or as directed. Other Ingredients: Rice flour, vegetable cellulose, Enzymax® (calcium carbonate, bromelain, papain, lipase, amylase, protease, silica), vegetable magnesium stearate.